Football Stats is your gateway to a quantitative understanding of football (or soccer as it remains known in the US and a few other places). Use the Football Stats app on ™Apple iPhones and iPads during a game to capture all the information about passing, turnovers and scoring to enable comprehensive and spatial analysis of a football/soccer game. Stress levels for both teams are shown in real time on the screen as you capture data. By tracking stress levels you can know when make substitutions and when to leave things alone. After a substitution, monitory stress levels to see how quickly the team responds to the changes that have been made. 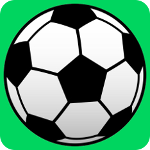 Monitor other game summary statistics in real time: summary statistics for the game are accessible with a single tap from the screen used to capture game data. At the end of the game, email your team and supporters with a game summary and the full set of game data. All of the captured data is available for download and later analysis. From within the app, you can also review detailed analysis of each play through the game. For example, review each sequence of passes starting with a goal kick to get a deep understanding of how the team is playing out from the back. The game analysis that is provided within the app is also accessible through this website. Analysis on the website is particularly powerful when working through post-game analysis. Identify where on the park play tends to break down; quickly analyse all instances of a specific type of play (e.g. goal-kick restarts) to show when strategies are working and when they are not. Use the wide variety of statistics to provide measurable targets that the team can work toward over the course of the season. Share the game analysis with players and team officials through this website by adding them as team members.